Data in the detailed table attached is by no means fully comprehensive - CWIF believe that what is attached is only be the "tip of the iceberg" in terms of numbers of accidents and their frequency. Indeed on 11 December 2011 the Daily Telegraph reported that RenewableUK confirmed that there had been 1500 wind turbine accidents and incidents in the UK alone in the past 5 years. Data here reports only 142 UK accidents from 2006-2010 and so the figures here may only represent 9% of actual accidents. The trend is as expected - as more turbines are built, more accidents occur. Numbers of recorded accidents reflect this, with an average of 10 accidents per year from 1994-98 inclusive; 44 accidents per year from 1999-2003 inclusive; 93 accidents per year from 2004-08 inclusive, and 149 accidents per year from 2009-13 inclusive. De vanligste ulykkene er vingebrudd og brann! By far the biggest number of incidents found was due to blade failure. 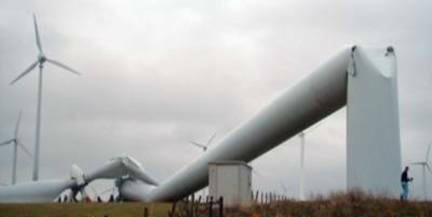 “Blade failure” can arise from a number of possible sources, and results in either whole blades or pieces of blade being thrown from the turbine. Pieces of blade are documented as travelling up to one mile. In Germany, blade pieces have gone through the roofs and walls of nearby buildings. This is why CWIF believe that there should be a minimum distance of at least 2km between turbines and occupied housing, in order to adequately address public safety and other issues including noise and shadow flicker. Fire is the second most common accident cause in incidents found. Fire can arise from a number of sources – and some turbine types seem more prone to fire than others. The biggest problem with turbine fires is that, because of the turbine height, the fire brigade can do little but watch it burn itself out. While this may be acceptable in reasonably still conditions, in a storm it means burning debris being scattered over a wide area, with obvious consequences. In dry weather there is obviously a wider-area fire risk, especially for those constructed in or close to forest areas and/or close to housing. 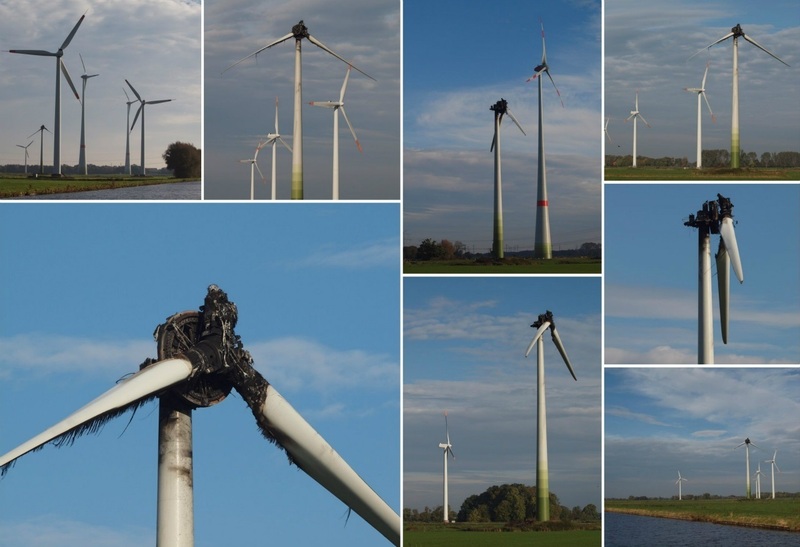 Three fire accidents have badly burned wind industry workers.